Question from Jesse: For the last two years I have noticed heart palpitations and hypertension following ingestion of “processed” foods. These include Cheeses (bleu cheese is the worst), Pizza, mozzerela sticks, store-bought salad dressing, Bacon, etc. I’ve been tested for literally hundreds of potential causes, with no luck. Does this sound like a tyramine intolerance? Dear Jesse, Let’s start by saying you definitely sound as if you are food intolerant. And that you have been wise to make a list of suspect foods. And you are wise to say it is probably substances in food rather than saying it is particular foods, such as blaming wheat or milk. You could suspect additives which are present in all “processed” foods. These are often culprits, along with amines, in food sensitive people. And I agree you are on the right track suspecting tyramine. But it is not the only amine that causes the symptoms you are distressed by. It can be any of the group of amines in general. Do go to the Articles section on this site and look under Amines with all the information on the range of amines that cause reactions. The knowledge that everyone is sensitive to their own particular amines came to me after researching what different patients found when they tested small amounts of excluded foods one at a time. Some could not tolerate aged cheeses, but could eat home-made gravy, or meat if it wasn’t aged, especially if it was cooked to just the right amount of browning and no more. The only way to find out what you can eat is by excluding all the suspect additives and other natural chemicals that most food sensitive people react to, for four weeks. You need to do this to allow the body to clear completely. Then testing can begin. You can read Tolerating Troublesome Foods for the Best Guess Food Guide as a list of over 300 foods with their risk rating out of 10, so you can see those with a low risk rating to use at the beginning. What is also important is the information on factors in you, the environment and in the food [particularly amines] so you can become very smart at gradually getting to a diet that is just right for you. It is good that you have been tested by doctors for hundreds of causes as that means that all the really scary or life threatening possible causes have been found not applicable in you. Why are there no neat tests to show food sensitivity exists, or even better which show just which suspect food chemicals they might react to? There are no tests because we still do not know exactly which metabolic pathways additive colours, flavours and the various preservatives are broken down, nor tyramine or the various amines, nor salicylates, or monosodium glutamate. The enzymes may be there but the process may be slowed for some, as yet unknown, reason. A big problem is that in some people only a very small amount of an amine can produce a big reaction. 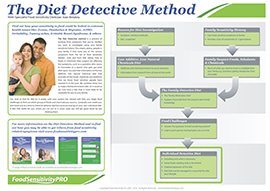 We do know that as you work through the diet investigation process using Are You Food Sensitive? you learn how to reduce what I call the Total Body Load of all food and environmental factors your ability to manage a little indulgence or mistake improves. You can read all about how to understand your own ability to smell and taste foods to work out how careful or daring you might be. It is worth discussing your diet plan with your doctor and keep him or her informed as you learn more by doing careful food testing to get to your own individual diet. I wish you well. Tyramines set it off. How many people have pheo when it’s really tyramine sensitivity and how many people have pheo that is set off by tyramines? Pheochromocytoma and amine reactions often have high blood pressure in common. So those with high blood pressure should have full medical investigations. “Pheo” often also includes headache because of the high blood pressure, palpitations because of increased heart rate, and sweating. It is an adrenal tumor where excess adrenaline is produced. It is a mono-amine so additional amines from the diet can produce amine reactions. Your doctor can order tests to confirm or exclude pheo.